AKC Standard Poodle from Dandee (retired) and Houston. 38 pounds. Quiet, calm and feminine. Jazz is a stunning, feminine version of her dad, Houston. She carries his color and athletic conformation and her Mom’s quiet, calm and attentive personality. A perfect blend of the two — Jazz — combined with either Robbie, (for our moyen-sized poodles), or Yankee, (for our mini-medium goldendoodles) will give us beautiful, friendly, and easily trained babies. “Tootie”, seen here on the day she achieved her International Champion Puppy status. Tootie is the very dark sable daughter of Lady Bug and Rowdy (both retired). She is a very beautiful, sweet and active miniature poodle. She loves to follow her guardian mom, Cathy, around the ranch where Cathy works (Terry’s Ranch) while Cathy feeds, cleans and waters the animals. She is also content on a lap watching tv. As long as she is with people she is a very happy dog. We are very excited to offer Tooties puppies. They will be very correct in body and temperament, showing off the beautiful grace and style of the poodle with the incredible intelligence, health and working aptitude so apparent in a Powder Valley Poodle. Dolce is the inky black daughter of our beautiful Dandee, (now retired), and Houston. I wanted to keep a girl from Dandee that would be just like her mom — sweet, calm, intuitive and, of course, beautiful. I succeeded with Dolce. She is just as nice as her mom and just as pretty. Her puppies will give us gorgeous inky black and red puppies when bred to Bandit that will be, sweet, calm, focused and easily trained. When bred to one of our goldendoodle studs we’ll get the same thing with a hint of golden retriever gentleness in an equally beautiful but smaller, package. Be looking for your next wonderful family pet, working ESSD service dog or therapy dog from one of Dolce’s future litters. Ziva is the beautiful daughter of Cous Cous Cootie (now retired) and Robbie. She is a very unique tri-parti-color in black, white and reddish brown. Ziva is a very sweet daddy’s girl — glued to her guardian Ethan’s lap when he is not working. She is a petite miniature poodle that weighs in at about 11 pounds and standing about 12 inches. Ziva’s unusual color is outstanding, but, unlike many unusually colored poodles — her conformation is stunning. She is the very epitome of a female miniature poodle — feminine yet sturdy, athletic, pleasing to the eye, and so, so, sweet and wanting to please. We are very happy with every aspect of this fine little girl and look forward to seeing what she produces. Skye is the stunning daughter of Dream and Bandit. A beautiful combination of Dream’s sweet, intuitive nature and Bandit’s calm, regal presence. Skye is a wonderful example of what a true working standard poodle should be: regal, intuitive, calm and focused. This makes for both a great service or therapy dog as well as an awesome companion for the family. We are very happy to be offering Skye’s offspring starting in 2018. Tam is a gorgeous, tall, lanky, solid inky-black standard poodle. An International Champion like her full sister, Tahoe, Tam looks nothing like her sister. She does, however, look almost exactly like her grandmother, Diva. Same coat, same head, same stance and same inky-black color. She looks so much like her grandmother that we wouldn’t be able to tell their pictures apart if they were not inscribed with names. Tam is a solid, calm and thoughtful standard poodle. She is dignified and watchful, quiet and respectful. We will be breeding Tam to Ollie to produce medium goldendoodles, to Robbie to produce moyen-sized poodles, and to Bandit for standard poodles with size and a quiet demeanor. Watch for Tam puppies in 2018. Pebbles is our European Yorkie/poodle cross that we breed to our toy poodle studs to produce our little Yorkie/poo puppies. Pebbles is soft, sweet, and a little bit submissive. She likes to play but she prefers to be held. Her puppies, so far, are little replicas of her in temperament. Soft, sweet, and quiet little lap dogs. A perfect pet for anyone who spends a lot of time indoors. Although Pebbles loves to run and play — she does prefer to be in someone’s lap. And, given the opportunity, she would stay there almost constantly. A lap dog and companion in every way. Truffles is the sweet little daughter of Pebbles and Vinny. She is a brown sable with white and weighs about 8 pounds. Truffles is three quarters poodle and one quarter Biever (European) Yorkshire terrier. Like her mom, Pebbles, she has a soft, sweet, affectionate personality. Like her dad, Vinny, she is smart, intuitive and friends with everyone she meets. When bred to tiny Flyer, our 5 pound toy poodle, Truffles gives us sweet, active, playful and BEAUTIFUL little tri-colored puppies that don’t get much bigger than 6 or 7 pounds. We will also be breeding Truffles to Chewie this year to see what she and he can produce. I’m anticipating playful, sweet, attentive (not to mention gorgeous) puppies maturing in the 8 to 10 pound range. Our International Champion Puppy, “Tahoe” is a blond bombshell. She is beautiful and she knows it! The epitome of standard poodle femininity, Tahoe is also sweet, bright, and just a tad entitled. Her puppies will be an interesting blend of Tahoe’s “Diva – ness” with her ancestor’s working and hunting lines. In essence — if you really like standard poodles and the way they conduct themselves and view the world — you will love Tahoe. She is all about beauty pageants, perfect hair, proper grooming and being admired. However, she also has a serious side. When asked to perform — she does. She knows that life is not all about HER…… It’s just MOSTLY about HER…. And perfect hair…. 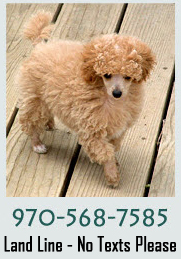 Gabby is an unusually marked phantom miniature poodle. She is a daughter of Rowdy and Lady Bug. She is a sturdy, correct, and beautiful miniature poodle who LOVES her “sister”, “Splash” (one of our goldendoodle girls) and ESPECIALLY loves her mama, Sharon (one of our guardians). Gabby, when bred to Vinny, should produce very nice, small versions of herself and Vinny in shades of red, apricot, sable, phantom and solid black. When bred to Robbie, we should see miniature poodles in red, red and white, apricot and white and sable. They will all be sweet-natured, athletic and want to please their people. Want a puppy that likes to retrieve? Choose a Gabby puppy! Splash is a sweet, laid-back, heavy-boned standard goldendoodle. She is half golden retriever and half standard poodle (mom, Dandee). We will be breeding Splash to both Robbie (to produce mini goldendoodles) and to either Houston or Bandit (to produce standard goldendoodles). When bred to Houston the resulting puppies will be maturing 50 to 55 pounds with big bone but not real tall. When bred to Bandit, we should see big, sturdy, large-boned standard doodles capable of pulling a wheelchair or assisting a large person as a mobility assistance dog. When bred to little Robbie, we will get mini doodles maturing around 25 to 28 pounds. Perfect family pets and therapy dogs. As sweet and the same color of the vanilla wafers that she is named after, Nilla is the standarddoodle daughter of Dream and Nemo. She is one half golden retriever and one half standard poodle. An exceptionally sweet, and steady family dog, we are very pleased to be able to offer her offspring with Bandit and Robbie to produce the totally non-shedding three-quarters doodles in both standard and miniature sizes. Nilla babies will be great, calm, steady and reliable therapy and service dogs and wonderful family companions. Sachi is a dream come true in a little dog package. She is sweet, playful, affectionate and smart. She is little and feminine and completely non-shedding. She, combined with our toy poodle Vinny, will give us beautiful little red-gold toy doodles that should mature between 10 and 15 pounds. Very small dogs WITHOUT the small dog attitude. Minnie is our cute and hardworking blonde miniature goldendoodle, a daughter of Robbie and Jersey. Minnie is a working mom — most days she is the official greeter and resident therapy dog at The Fort Collins Dentist, a dental practice in Fort Collins, CO. Although we own Minnie, we feel dogs should not live their lives in kennels, so we placed Minnie with the dental practice as their therapy dog when Minnie was only about 4 months old. She is wonderful with the patients, greeting and giving comfort to those that have dental phobias or are uncomfortable having dental procedures. She creates a joyful energy at the office and is loved by staff and patients alike. At night she goes home with dental tech Sara where she is the much-loved family companion to Sarah, her husband, and children. We are very excited to offer puppies from Minnie and Vinny, our red sable toy poodle, starting March of 2018. Rosie is the daughter of our wonderful Breeze and Vinny. She is little, active, smart, and like her mother was, fearless. She is not a princess — she is THE Queen. And you’d better remember that. Expect Rosie puppies to be small, full of life and devoted to their people. Small, fearless guardians of home and family. I once witnessed Rosie’s mother, Breeze, chase a full grown Badger off of our property. 8 pound poodle against a 25 or 30 pound, full grown badger. The badger didn’t have a chance. I wouldn’t have believed it if I hadn’t seen it with my own eyes. I imagine that badger never lived it down and became the laughing stock of all of badgerdom in Colorado. But believe me, if you could have seen that tiny dog in full “Get off my property you stinkin’ varmint ” mode — you would have run too. So, remember — just because Rosie is small it does not mean she is delicate. She is little — but like her mother — she is mighty. I think that badger made the right decision. Dream is the beautiful daughter of Isis and Houston. She is stunning, with very correct conformation and an elegant carriage. Very personable and tractable, we are very excited to offer puppies from Dream. The puppies will be beautiful, in shades of gold and apricot, with sweet, caring personalities and an intelligent, sensitive temperament.Very suitable as emotional service, therapy, and PTSD dogs. Also, of course, wonderful companions. Allie is a strikingly beautiful, very correct miniature poodle. She would have had an awesome show career but has been a mom instead. Allie is quiet and unassuming. She likes to “go with the flow” wherever the flow is going. She is not one to be stubborn or opinionated. Instead, Allie tries to just get along and be part of whatever is happening around her. She isn’t shy, she just isn’t pushy. She doesn’t want to be in charge but neither does she want to be last. She will produce beautiful, structurally correct and mentally sound poodles who will excel in any endeavor as long as they get to be with people. Want a 15 pound agility competitor? A hiking partner? Obedience champ or therapy dog candidate? How bout a perfect family dog and kid’s playmate? Look to a puppy from Allie. Ritz is the beautiful daughter of Lady Bug and Rowdy. She is turning from a red sable to a very light silver beige and weighs around 10 pounds. Ritz is the AKC miniature poodle girl that we breed to our Biewer Yorkshire Terrier boy to produce our little Yorkie/poo puppies. These puppies come in a variety of colors and so far the combination has produced both very small puppies and bigger puppies most likely maturing around 10 or 11 pounds. Ritzy is one of the sweetest dogs on Earth and is extremely tolerant of EVERYTHING. Ritzy, like her mother, Lady Bug, loves stuffed toys, kids, nyla bones and watching tv on mama’s lap. Isis is the beautiful brown and white daughter of Diva and Beau. Isis is an elegant, serious, and VERY SMART replica of her mom in temperament. If she were human, she would be Amelia Earhart, Madam Curie, and Cat Woman all rolled into one. People notice this dog, whether she is walking down the street or walking into the room. She draws attention just by standing there, quietly observing her surroundings. She is really something! Isis is no push over, she is assertive and self-assured. Her puppies will have the genetic material to carry over this confidence and self-assurance. They will also have the genetics of Beau, Isis’ dad, to be sweet, affectionate and tolerant. In other words, depending on with whom we breed Isis, the puppies should be varied in temperament with sweet, assertive, calm, and tolerant all in the mix. Maya is the beautiful, silver-haired daughter of Dazzle and Nemo. She is a straight cross between a standard poodle and a golden retriever. She gets her gorgeous color from her grandfather Alex and her sweet, sweet, laid back personality from both Dazzle and Nemo. Maya in her guardian home with one of her six kids…. She is a GREAT babysitter! Maya lives with 6 kids. To say she is a tolerant, gentle, soul is an understatement! Everybody who meets Maya wants a dog “just like Maya”. They want the personality and that gorgeous color. Although we can’t clone Maya, we can offer her babies top life-long, loving homes. Her babies, combined with Houston, will produce non-shedding, sweet-natured, kid-friendly companions and service/therapy dogs. We are very proud to offer these beautiful puppies.